Fresh mushrooms are a pretty common vegetable, found loose or pre-packaged at the grocery store. There are quite a few varieties to choose from – Baby Bella or Button mushrooms are a good place to start, since they are hearty mushrooms that hold up well in stews or for making stuffed mushrooms. Mushrooms get all sweaty if you store them in a plastic bag or leave them in the pre-packaged container you bought them in. If you are not going to use the mushrooms immediately, they should be stored in the refrigerator in a paper bag. Alternatively, you could put them on a plate with a paper towel both under and on top of them. (The top one should be slightly damp.) They should be used within three days of purchase. Some mushrooms are really dirty and some only have a small bit of dirt. The button mushrooms shown in the picture below are relatively clean. They only need a quick rub with a paper towel and they are ready to use. The Baby Bellas on the other hand are really dirty so they need to go into a colander and get quickly rinsed under running water. Then, with a paper towel, you should wipe off any remaining dirt. Some people say you should NEVER wash mushrooms as they act like little sponges and absorb too much water. However, as long as you DO NOT SOAK the mushrooms, cleaning them with water and then wiping them is faster and more efficient than wiping each one individually. Some mushrooms can have very tough and “woody” stems. You can just pop off the stems. Or you can cut them out using a small paring knife. Then chop them up and use them in whatever you are cooking! One of my favorite salads is made from just fresh sliced mushrooms, mayonnaise, vinegar, and parsley. I just wash and slice up a box of mushrooms quite thin with a very sharp knife. I like to slice them with the stem and cap still together to get nice full-mushroom cross-section. In a separate bowl I combine vigorously about 1-2 Tb of Mayonnaise with 1-2 tsp of wine vinegar. I add a bit of water if it seems like the dressing is too creamy. then I put in a pinch (1/4 tsp) of salt and about a 1/4 cup of chopped flat leaf parsely. It’s best if the dressing is not to watery, because the salt in the dressing will cause the mushrooms to release a little bit of their juice, so the salad will naturally thin out a little while it rests. It’s very refreshing if kept in the fridge, and it’s nice combined with other salads, like grated carrots salad, or in a green salad like in a summer salad spread. Great Information Kathy! Did you know that the length of time mushrooms should be kept for varies with the type? 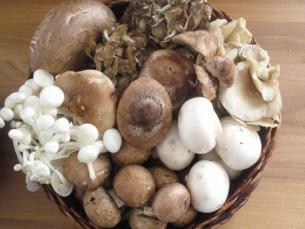 Whites and criminis should be used within 3-4 days, portabellas 5 days, shiitake and enoki 6 days, and oyster 5 days. These timelines are accurate only if kept in the proper conditions; in a brown paper bag in the fridge. Hi Will, your mushroom recipe sounds wonderful! Have you ever tried it with sour cream? Thanks for jumping in Mushroom Lady! Great info! No Kathy, I have not tried it with sour cream. But I just ran out of sour cream… Do you know why ? That’ because I just made some onion-soup dip !! yum yum yum ! Welcome to my world Will! Hi, new to mushrooms and have some packaged sliced baby portebellas that have been in the fridge but not sure, but maybe over a week. How can you tell when to not use them? Will they have mold on them or what? Help! Sorry to say but my guess is that these pre-sliced mushrooms are probably not usable. Old mushrooms get bruised looking, slippery, and even sometime wet looking. The texture also gets mushy. You will not necessarily see obvious mold (like you would see on old cheese), but they can also develop a musty, earthy odor which is pretty unappealing. Thanks Kathy, I will put these in a brown paper bag if I do not use them the day I purchase them and then when I do use them I will , rinse them off in a colander within 5 days on the baby protebellas. Is that the right way? BTW pre-sliced mushrooms have a shorter shelf life than whole mushrooms! My suggestion would be to buy whole mushrooms and wash them yourself. OR by sliced mushrooms and use them immediately! Hi nafisa, it sounds like you bought some portobello mushrooms. My photo-tutorial on Portobellos and Goat Cheese shows a photo of them. As I did in this recipe, cut off the stems and throw them away. This particular type of mushroom has a very tough stem. With a spoon, scrape out the gills and then slice the mushrooms. For a pizza, I would probably fry them about 2 Tablespoons of olive oil first, just to soften them a bit. Then add them to the pizza. You can use the mushroom just how you bought them! Give them a quick rinse or wipe with a damp paper towel. Slice the whole thing (stem and all) and place on top of your pizza. MMmm I love mushrooms on pizza, especially thickly sliced portabellas! Enjoy! Mushroom Lady I am so glad you jumped into help! Wow! We seem to have given Nafisa totally different advice! Just goes to show how in cooking it all depends on your own personal likes and dislikes. I’m not crazy about Portabella “gills” but Nafisa, you clearly have a choice and whatever you do I am sure it will be delicious. I’m off to check out the Mushroom Lady! I’m with the mushroom lady it has to be said. If it is a portobello mushroom just slice the end off the stem and give it a wipe. You can also peel the skin off. Mushrooms – Love ‘em! So is it just me who has an aversion to gills? Nafeesa, thank-you! Were it not for your question, I’m not sure we would have met The Mushroom Lady! You know, I never ever take out the gills! I find that, that is where all the wonderful mushroom flavour hides. I have also heard of people going through the intense process of peeling mushrooms, I never do that either. I eat them raw or cooked just the way they are. But you are right Kathy, I do remove the stem on portabellas and shiitakes, they are just to chewy. I save them to make stocks. Hello. I didn’t realize how short their shelf lives are! What can happen if I feed to my family, say a week after purchase? Thanks in advance for any feedback. Diana, you will know by looking at your mushrooms if they are too old to eat. They can develop unappetizing dark spots as well as a very unpleasant surface texture. Re: Portobellas -Try them grilled. Brush with olive oil & cook both sides like a steak, medium heat, over flame, until starting to look burnt. Great! I do it all the time.